FAIRBANKS — A local brewery is a great thing, offering the constant availability of fresh beer, and a frequently changing number of palate-pleasing options rotating through to the tap handles. At HooDoo Brewing Co., this has allowed the fledgling brewery to develop a loyal following. HooDoo continues to turn out creative offerings with a particular interest in German-style brews. Most are brewed in small batches, allowing for that regular rotation, but if there is one complaint, it’s that there are rarely more than four beers available at a given time. A wider-selection would be a bonus, especially if the rich, dark, chocolaty stout remained a regular featured brew. 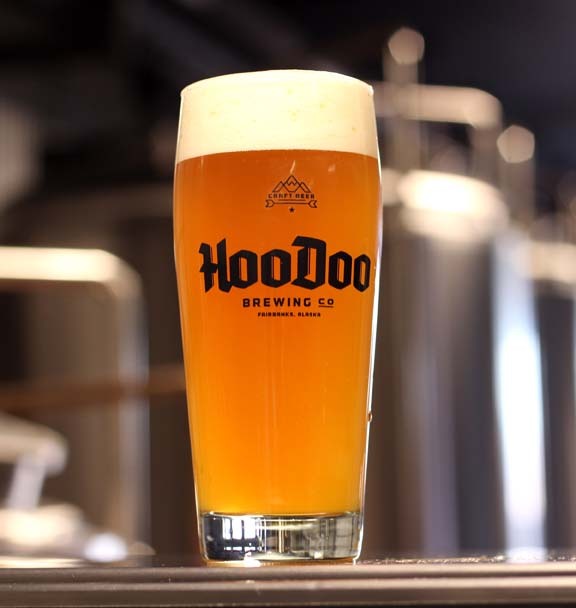 There’s no denying HooDoo’s limited by space, but keeping several flagship beers on tap and rotating through new brews would end such disappointments. “That’s a beer for cooler weather,” the barkeep said of the stout. Oh well. It was cloudy and cool before the coming storm, but I started with the perfect summer quencher in the form of German Kölsch. Get a growler to go for the next German World Cup match and enjoy the soft, fruity punch found in this lightly golden beer. The beer pours with a light head that’s just strong enough to give the beer legs. Spicy old world hops zip about the tongue, despite this affect, this centuries old traditionally-styled brew finishes clean and dry. Those enamored with fruitier styles will enjoy the Belgian Saison. Saison is a classic “farmhouse” style ale, a type developed in Southern Belgium and Northern France using wild yeasts. Now “under control,” that yeast imparts flavors as diverse as cloves, old bananas, mango, apple and peppercorn. These flavors, which stand out strongly, create an overall earthiness, almost mustiness, but rolls into a spicy and cloyingly — surprisingly — short finish. Another great summer brew, HooDoo’s Bavarian Weissbier is crisp and refreshing with a tart mouthfeel, mild banana and clove hints, and fresh bready finish. While American wheat counterparts tend to feature more earthy or grainy flavor profiles and a pure yellow color, Weissbier’s have a heavier malt bill — not a lot, just a touch — for a richer burnt gold color and that broad overall flavor. This beer feels surprisingly heavy in the mouth, yet is light on the palate. Hops in weissbiers are incredibly mild as well (American versions less so), and this offering was no exception, with the lightest hint of bitterness balancing out the malt. Rounding out what’s on tap is another brewery favorite, the American IPA. The Indian Pale Ale was originally developed in England when beer destined for troops stationed in India was “overloaded” with malt and hops. Americans took this style one-step further, powering up the hops (frequently Cascade, Citra or Centennial) while instead favoring medium-bodied Crystal malts. HooDoo’s offering is spot on. Clocking in at a reasonable 73 IBU’s (International Bittering Units) this brew is packed with hops for an aural and tongue-wagging delight, but is also well balanced with rich and slightly nutty endnotes. And that’s what’s on tap. Glenn BurnSilver is a former Daily News-Miner features editor now living in Arizona who is visiting Fairbanks for the summer. American Craft Beer Week has come to a close, but we still have two exciting, seasonal releases in the Taproom – A Maibock Lager and the Bavarian Weissbier. In Germany, Maibocks and bright wheat beers are released in May to celebrate the change in seasons and the launch into spring and summer. Here at HooDoo, it’s no different. May in Fairbanks is certainly a time of celebration – no more snow, greening trees, flowing rivers, and the long awaited midnight sun. May is a great time in Fairbanks, and Maibock and Bavarian Weiss are the perfect beers for it.